Putting players in the shoes of a character and getting them interested in their objectives without even telling them their name is a hard feat to accomplish. The Station is a game that is able to do that and more. This new indie exploration game will put you in a dangerous situation with only the answers to why you are doing what you are doing, nothing more. An ancient alien species has been discovered while at war with itself. In order to find out if we are compatible to connect with this new species a three man crew is sent in a specially designed station. Their goal is to observe and report the habits that the alien species has. During the mission, something goes wrong. 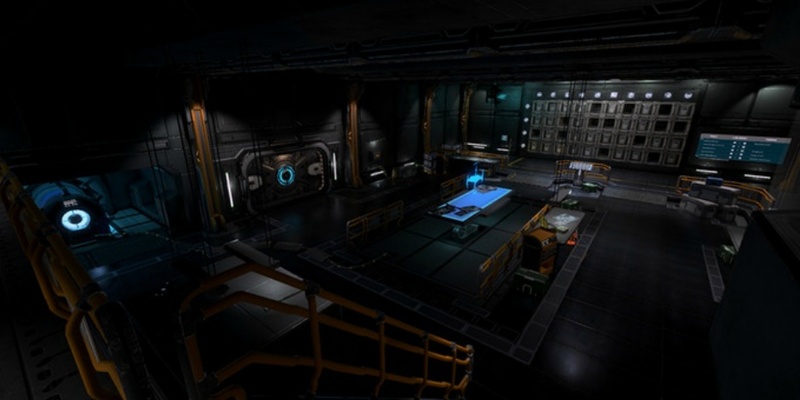 Power failures and emergency reports have been received from the station and so, to find out what is going on, a recon specialist is sent to find out what happened on board. Throughout the game you will come across multiple audio logs and notes. All of these tell more of the story and can also give hints for what you need to do next. Finding the small notices or figuring out a riddle, notes provided the most hints to help you advance forward through the game. You will be able to interact with a lot of items in the game, but only a few of them will actually matter. Although, it is fun to explore a space ship seeing as its not something you usually get to do every day. Solving the various puzzles was the hardest and most time cosuming aspect of the game. They are mostly pretty difficult. While some require you to find a specific item that will give the answer, there are some that you'll find yourself trying to decipher. I even got to the point where I was just guessing and hoping I was right; which worked only one time. There is no combat, but there will be little events that happen while you are advancing through the game that will give you goosebumps. If you pay close enough attention, you could catch all the different times that the alien shows up during your playthrough. The game looks like you are really in the ship. They did a great mix with the lighting, creating a scientifically advanced atmosphere, and are able to really show how high tech the science behind the station really goes. There wasn't a lot of music except for climactic parts. Most of the time was ambient sounds that gave the feeling that your alone, but something is wrong. This helped bring out the "am I really alone" feeling as you continued to make your way to finding the truth of what happened. There are a lot of audio logs, but their rather easy to find. Completing everything in the game is practically on the way meaning you can do everything the game has to offer on your first playthrough. Not a lot of reasons to go back through the game. I thought the controls were a bit difficult. Having to move on screen slides manually with the mouse was rather difficult since it wasn't an easy slide across. If that was easier, or if just clicking on it would slide it, then it would help. It's a very challenging puzzle game that will take a little bit of deciphering and a lot of guessing. The story is an interesting one with a twist that could shine light for many on the idea they bring across. I enjoyed playing it and venturing through the story, nerves on edge most the time.